Spring is right around the corner; should you be thinking about installing new exterior siding on your home this year? Depending on the size of your house, there's no doubt that replacing the siding can be a significant expense. However, there often comes a time when staying with the old cladding can cost you more in the long run. This guide may help you decide if this is the year to say goodbye to your home's old exterior veneer. 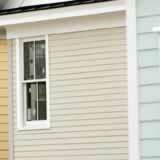 Is 2013 the year to install new siding? Your annual energy costs are rising. Energy Star estimates that families can reduce their annual heating and cooling costs by up to 20 percent by insulating and sealing their houses properly. One of the easiest ways to increase the R-value of your exterior walls is to install insulated vinyl siding. CertainTeed's CedarBoards siding can add up to 2.7 in R-value to your home's insulation package, and Georgia-Pacific's Seasons insulated vinyl siding is rated at 2.8. Your exterior maintenance costs are skyrocketing. If your home has wood siding, how much are you spending to keep it in good shape? The R.S. Means Repair & Remodeling Cost Data guidebook estimates that it can cost about $2,500 every time you brush two coats of latex paint on to the exterior of a one-story 2,100 square foot home. Your costs might vary depending on your location and the paint product used. Replacing that wood siding with prefinished fiber cement or vinyl siding could reduce your exterior maintenance expenses significantly. It's time for a fresh look. Whether you're thinking about selling or it's just time for an exterior update, installing new siding is one of the best methods for improving your home's curb appeal. Siding manufacturers introduce vibrant new colors for their fiber cement and vinyl product lines almost every year. CertainTeed added six new vinyl hues and ten fresh colors for their fiber cement products in 2013 alone. And prospective buyers seem to like new siding on a home as well. Remodeling Magazine's Cost vs. Value Report for 2013 estimates that homeowners may be able to recoup almost 73 percent of the costs of installing new vinyl siding when they sell their home. The possible return on investment for fiber cement is even higher at close to 80 percent. The estimates are based on a national average and may differ in your region. Based on these guidelines is this the year to install new siding on your home?